Eastern Hognose snake is a sleek, mildly or almost non-venomous and very interesting species of snakes. Their defensive nature is as interesting as their other traits of behavior. The species is perfectly safe and not endangered. It is widely found in many regions of the US. 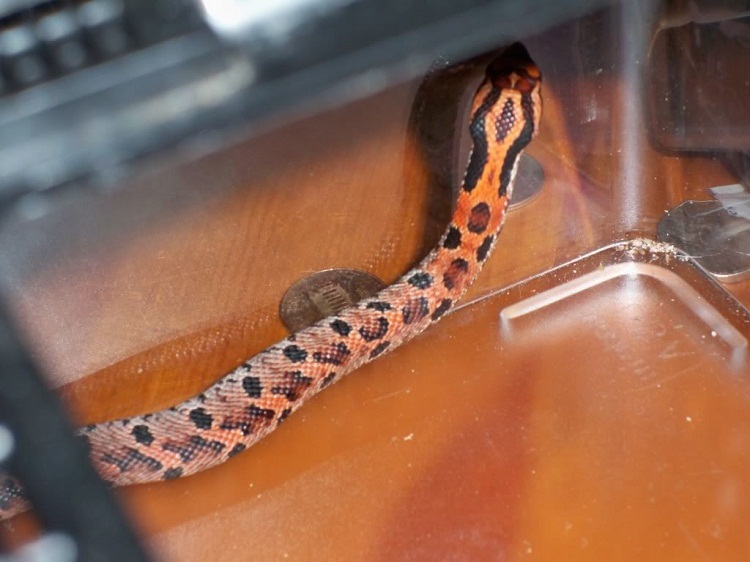 It can be an exotic pet if taken proper care, as it almost never bites. Length : An average adult Eastern Hognose snake is of about 28inches in length. Females are longer than the males of the species. Appearance : Their nose is a little upturned, which helps them to dig into sandy soil for habitat. Skin : The skin color varies a lot. It can be found in red, orange, brown, green, black, grey, and in many other earthly colored shades. Even the patterns are very much variable. Checks, blotches, even pattern-less can be found. The underneath side of the snake is solid grey, cream, and yellow colored. 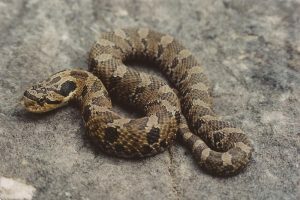 The Eastern Hognose snake is one of the non-venomous snakes. They are a very interesting species to observe their behavior. This species of snake is very shy. They get frantic when feel threatened. Records show these species bite rarely. These snakes are more active during the day. Spring is the time of the year when they are most active. They stay mostly exposed and rarely inside some shelter. Spring is also the time when they are most active for reproduction. They have a very uncommon defensive nature of tricking and faking away their predators. 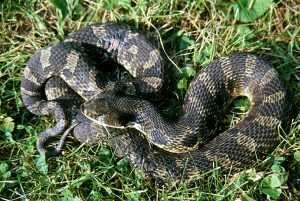 The exotic species of snakes are found across a wide range of U.S.A. Eastern Hognose snakes can be found throughout the eastern coast of the United States. In the western coast their range spreads over the Appalachians and all over the Midwest. They are to be spotted throughout south of Vermont to south of Florida, in the eastern part of the country. They have been traced at the Great Lakes in western part of the country, in south the species can be traced throughout central and eastern Texas. 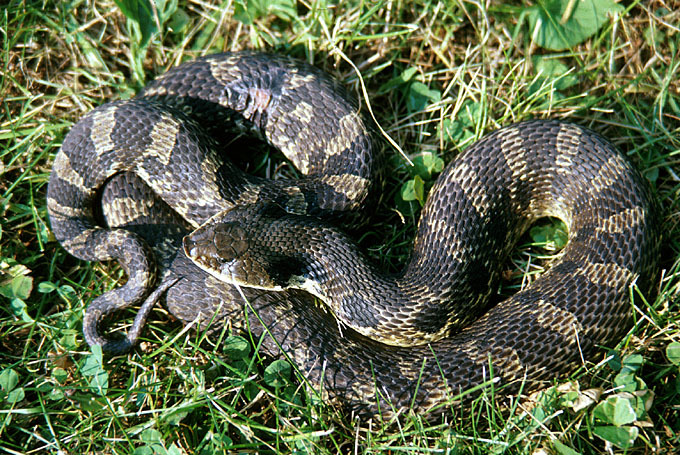 Eastern Hognose snakes have been also found in the entire northern and southern Carolina. These snakes are likely to be found in woodlands where there is sandy soil. Coastal areas are also a favorite of them. They can also be found in and around farmlands and fields. These snakes live up to 12-15years, unless face an unnatural death. 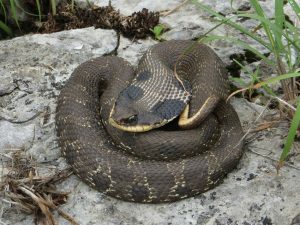 April to May is the mating season of the Eastern Hognose snake. They are mostly active during spring season for reproduction, and also during the fall sometimes. The female species lay about 8 to 40 eggs, in a season. Those eggs take a period of about 60-65days to hatch. The hatchings come out around late July till September, and they are their parents’ look alike. Eastern Hognose snakes belong to the colubrid species. These species are harmless species of the snake family tree. 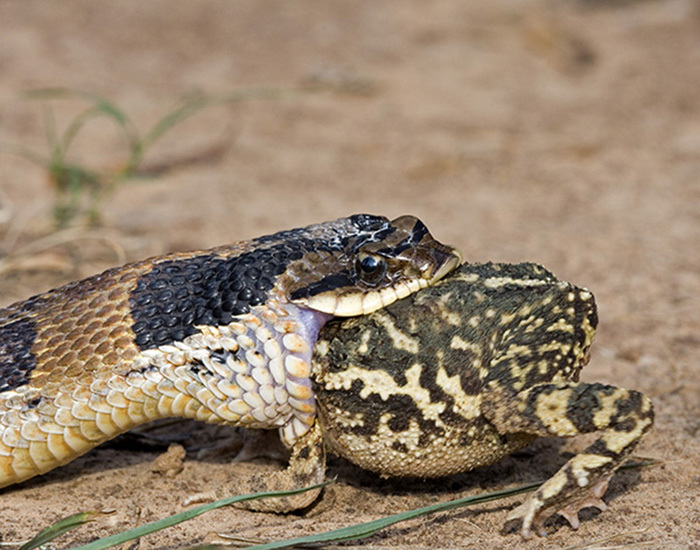 Toads are the most common and favorite diet of the Eastern Hognose snakes. 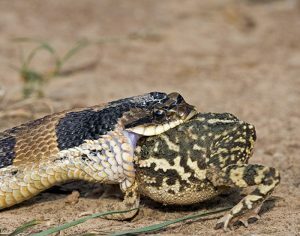 If there is a dearth of toad, then the species can also suite themselves with small birds, birds’ eggs, insects, smaller snakes, young snakes, dead smaller or bigger animals, small mammals, lizards, and reptile eggs. They have strong teeth that help them stab the prey and eat, and not just swallow. The Eastern Hognose snake is a very interesting species to observe. They have some very curious attributes and characteristics. Quite unlike snakes, nose of the Eastern Hognose snakes have tilted upright nose that help them dig into sandy soil. These snakes belong to the poison-less species of snake family. Their defense mechanism is also very interesting. They pretend to be dead to trick their predators. They also pump up their necks from inside, when feel threatened, to fake the predators and look like cobra, a real dangerous species of the snake family. The Eastern Hognose snakes are not identical to each other. They are found in varied colors and patterns. Their irregular color and pattern help them adapt themselves to the multi-colored surroundings. These snakes do not swallow their prey, they grab and stab them with their teeth and then eat. 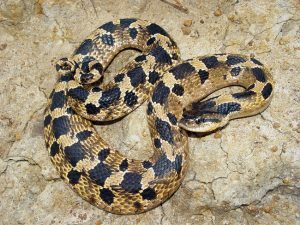 The Eastern Hognose snakes are not endangered species. They are found in huge numbers over a large area of the US. The species is very shy in nature. The species is not dangerous for the humans to pet since they are non-poisonous, but it is harmful for the snakes to breed in captivity. Their digestive system and liver malfunction and could be even fatal if their proper diet is not provided. Though this species of snake is easy and widely available in black pet market but it is very difficult to maintain them. Their diet is quite troublesome to arrange on a regular basis. It has been observed that if not fed properly coping up with their natural diet then the species stand risk regarding liver troubles. It has been studied that when bred in captivity, their natural life span also decreases. This species of snakes are not aggressive types. They only attack to be defensive when feel threatened by the predators. They have many defensive adaptive features. Colors and patterns on their skin help them camouflage with their surroundings, thus helping to be difficult being spotted. These species are impervious to the otherwise poisonous secretion of the toads’ body, thus helping them not being threatened to their natural feeding habit. When feel threatened by another species of animal or humans around they inflate their anterior part to make themselves look bigger and resemble to fatally venomous Cobras. This helps them trick away from difficulty. If the above mentioned trick fails, then they fake dead by rolling up and hanging their tongues out, making it look even natural. According to IUCN Red List Of Threatened Species, the Eastern Hognose snakes are quite safe a species as of yet. They are widely distributed, that too in large population. Neither their diet nor their suitable climatic condition is under threat, thus not even the species is. This exotic species of snakes are very shy. They are completely harmless as they are non-poisonous. But petting them might not be a good idea for their existence longevity. But it is very interesting to observe them. Though the species is completely safe in terms of their existence, still it is better to be careful not to threaten their existence number in singles. I have spotted the black yellow spotted hogenose in my yard. Anyone know how I can get rid of it. Boo-yah! Think I just discovered the snake I & my faithful pooch almost stepped on in a pile of leaves during a trekk in the local woods. Looked like Diamond Back w/o the rattle. Not aggressive, just backed up and continued on it’s way. Not me I grabbed the dog and deserted the spot faster than a duck from a shotgun blast.